BONGIWE is a recipient of the Jazz Winner of Art and Culture @UShaka Marine, Sibaya Casino, Playhouse Test Drive Award 2011 to 2012 in honour for her contribution to the art industry. Well known as Ms Classic /The Durban Diva is no stranger to audiences. 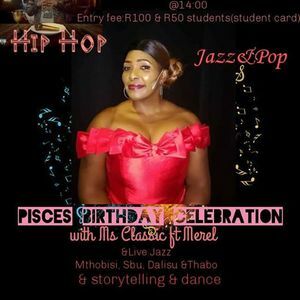 She is an all - rounder singer and her musical home is either in an Operetta (Playhouse Chorale Soprano), classical music, musicals, pop, maskandi, blues, afro jazz and Gospel. Also known as Mabongi on Highway Radio 101.5fm she is also a co-host radio presenter from 7pm to 9pm every Saturday in a programme called Ulozolo. She is currently working on her debut album with a sweet mix of cultural crossover repertoire of Afro-Jazz with an influence of Maskandi with Matshitshi Ngema, Pastor V. Ngobese of ECC Church (Gospel Maskandi Album). During working hours she is in the classroom teaching Life Skills and Creative Arts at Hlengimpilo FSS at Umzinyathi Area Inanda. Bongie won numerous singing awards and toured to ten different cities in Europe with well-known artist Sbongile Khomalo and Sbongile Mngoma. She was also part of the Diva’s chorusing the UShaka Requiem in 2005 by the Black tie ensemble with the well-known Old Mutual /Telkom Champion chorus choir Gauteng Choristers. In 2011 she started to be selected as one of the best female adjudicator in entertainment competitions, UCCSA Church, UShaka international Airport, and coaching schools, Sondelani Secondary, Waterloo Primary, Syandamazulu Primary and Tholamandla secondary Schools. Returning back to Durban in 2006 she was featured in numerous concerts and shows with different musicians, like Abigail Kubheka, My Fair Lady, Ingqayizivele (Mnomiya) Mozart’s requiems, Olympic opening in 2011-2012 and Messiah Handel requiem, under directors such as Mbongeni Ngema amongst many. In 2012 she formed the Durban Divas trio sharing the stage with Pinkie Mtshali and Sheila Khumalo, while grooming other female singers. 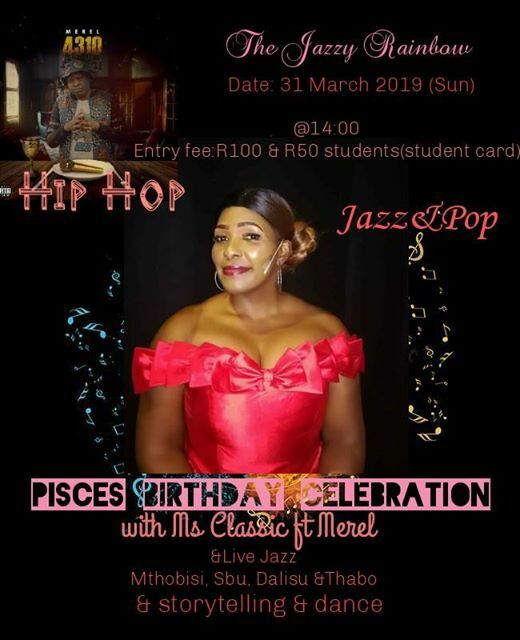 On Concert day she will feature different acts like Mthobisi Mthalane, Storytelling and dance by Thuli, Hip Hop by Merel and more Jazz with Miss Classic with the jazz band.